Today on the podcast is Lauren Chandler…. Lauren is a wife and mother of three. Her husband Matt serves as the lead teaching pastor at The Village Church in Dallas, TX. 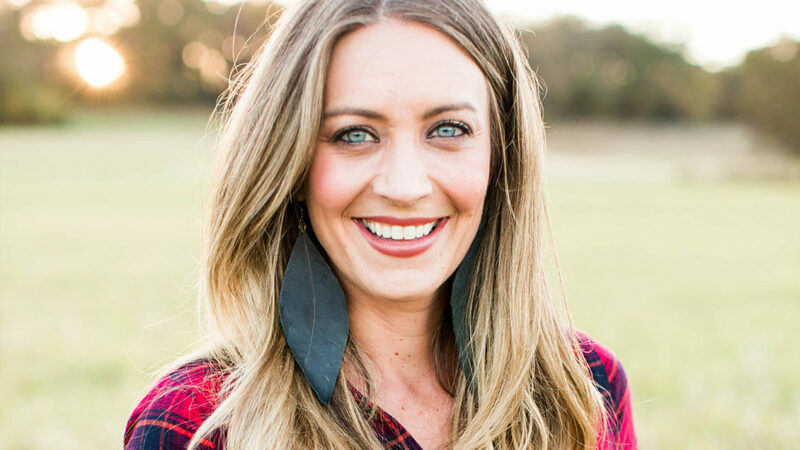 Lauren is passionate about writing, music, and leading worship. As I began my interview with Lauren, she painted a visual picture of a rooted tree. She talks about how incredibly important it is to be rooted in who she is in Christ – living her life out of that sure relationship and knowing she is loved by Him! She describes how roots are strong, even enough to break up concrete, and if we are rooted deeply we will not easily be taken out by scorching heat, wind, or unexpected storms. Lauren and I talk about how she defines the word thrive and how she has felt vulnerable at times in her life. She shares how sometimes “her life feels a little lop-sided in some areas” and describes the “staples and immovable rocks” she has in place in her life that are solid and real. As we move through the conversation, Lauren shares a real struggle she faced for years, but was afraid to share because she is a pastor’s wife. She wrestled with being truly vulnerable, but she wanted to overcome the voice in her head that kept telling her “I know I’ll be good enough if or when I’m perfect.” She had finally had enough of herself and went to Celebrate Recovery. It was there that she began her journey to true freedom in Christ. Finally, we talk about parenting, being a wife, and learning to be gracious. She describes how in Proverbs 27:17 “As iron sharpens iron, so one person sharpens another”. In her marriage, she felt at times like a “damp rag” and it wasn’t until she began to face her fears, and admit she isn’t perfect, that she could become iron for her husband Matt. Lauren has just released a new book & Bible Study called “Steadfast Love” which is a meditation on Psalm 107. The book describes four groups of people in distress; some in a desert, some caught in chains, some who have made foolish decisions, and some caught in storms which suddenly overtakes them. In this study, she weaves in how God’s people overcame these life challenges and saved them all. What: The purpose of IF:PRAY is to gather women from around the world in prayer. We believe God hears and answers prayers, and we want our focus to be a time of seeking the Lord in this way in our communities. We live-stream this event so women around the world can join in at the same time from right where they are. Today on the TBB podcast, I am super excited to share my interview with Kat Harris. Kat grew up here in Dallas and was one of six children. Her childhood “looked normal” to everyone else, but the reality was her family was broken. Her dad was an alcoholic, became homeless, and her parents divorced. Kat spent most of her teenage years and even into college searching for approval. She didn’t realize how chaotic and stressful her world had become and how all these unhealthy storylines she had lived would affect her. Her health suffered, she was mentally exhausted, developed an eating disorder and continued to date the wrong guys. But, only by God’s grace, her dad became sober when she was a senior in college. Relationships began to be restored, and Kat realized how “struggle and pain” want to be kept hidden, but when you bring truth to light, fear loses its power! As we talked more about her story, Kat shared how she would define the word “thrive” and how she overcame a “survival mentality” that she had lived her whole life! Today, Kat has created balance and rhythm in her daily life and has a “life board-of-directors” who have all access and keep her accountable. She has learned that “real change happens when we show up”, start small and commit to the journey you are in. Kat and I could have talked for hours, but we conclude the interview talking about The Refined Woman, an online magazine she and her friend Emily Scott started where they share real stories that empower women to embrace their beauty, identity and value through the art of storytelling! PS. Kat has created a guide with practical steps on Moving Through Fear. Be sure and check out this valuable tool! Today on the TBB podcast I am super excited to have a very special guest and friend. Kathie Lee Gifford and I first met in 2009, when she and Hoda had Jeff and I on their show, to talk about our book, I Do Again. Since then, we have had many opportunities to see each other in NYC, talk about our kids, and share the latest is in our lives! She has had a successful four-decade career as a television host, actress, singer, playwright, and author, and is best known for her 15 years on “Regis and Kathie Lee.” As most of you know, she is the co-host of the fourth hour of the Today Show with Hoda Kotb. One of the things I love the most about Kathie Lee is that she is unashamed about her walk with Jesus Christ, and shares her walk whenever possible. On today’s podcast, Kathie Lee gives us her insight about how she has learned to thrive, regardless of the circumstances she’s been given in life. In our conversation, we talk about what you can do to prioritize your day, stay positive, laugh and enjoy every moment you have. One of my favorite things is talking about her daily call with her mom! Kathie Lee also has a new book coming out in March 2018. The Rock, The Road, And The Rabbi preorders start September 21, 2017 and I can’t wait to get it! CLICK HERE to tune into my interview with Kathie Lee Gifford. Today on the TBB podcast is one of my sweet twin daughters, Lauren Scruggs Kennedy! Lauren and I first met in 1988, when she and her twin sister, Brittany were born to her dad and I at Southbay Hospital in Redondo Beach, CA! Lauren was born in Redondo Beach, CA but raised in Dallas, so she calls herself a California girl whose roots are deep in the heart of Texas. In December 2011, Lauren’s life was forever changed. She was hit by an airplane plane propeller; which resulted in a brain injury and the loss of her left eye and left hand. Lauren began to realize that brokenness can be beautiful, even amidst unexpected suffering and pain. Lauren became the bride of Jason Kennedy, co-host of E!News in 2014, which also made her a new resident to beautiful California. She is a lifestyle blogger, the co-author with her family of the book “Still LoLo” and sole author of her book, “Your Beautiful Heart”! She is the Founder of LaurenScruggsKennedy.com, a lifestyle blog rooted in balance- igniting honest talk and celebrating stories. LSK is a haven of positivity including posts on healthy living, clean beauty, delicious recipes, relationship talk, style updates, shopping ideas, and so much more. She and her team recently launched the Lauren Scruggs Kennedy Foundation this past Dec 2016, which exists to bring hope, restore dignity, and ignite faith in girls and women with limb loss by providing beautiful cosmetic coverings for prostheses. She also just launched, along with her twin, Brittany and Brittany’s husband Shaun, and her best friend, a loose powder dry shampoo for all hair types called Stranded. Lauren became an aunt, affectionately called “Aunt Lolo” to her niece Kate last Oct! Here is my interview with Lauren Scruggs Kennedy!